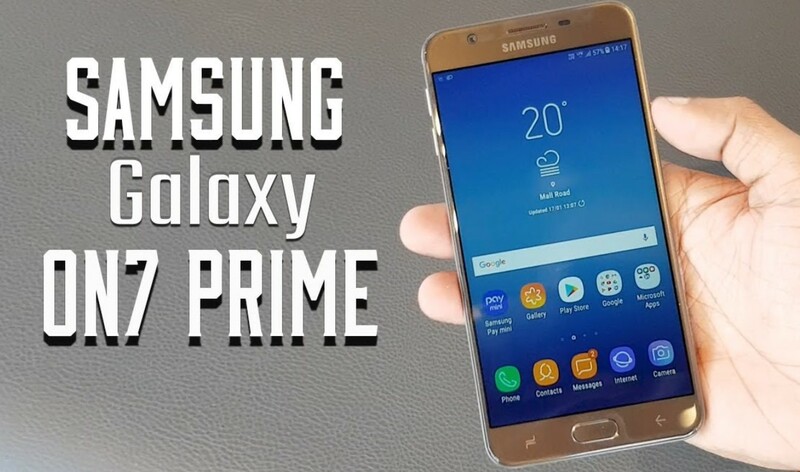 In the first month of 2018; Samsung came up with the Samsung Galaxy On7 Prime which is the first budget smartphone of the year. To give a glimpse of the Samsung Galaxy On7 Prime, let’s move on to the specifications. Samsung Galaxy On7 Prime runs on Android v7.1 Nougat operating system. Moreover, it is powered on 1.6GHz Exynos 7870 octa-core processor. The display on the phone is a 5.5-inch standard 1080 pixel display. About the memory, the Galaxy On7 Prime comes in two variants based on primary memory and secondary memory; one with 3GB RAM and another with 4GB having internal storage of 32GB and 64GB respectively at a price of 12,990 and 14,990 respectively. The secondary storage is expandable up to 256 GB using a micro SD card. Talking about which, it has a dedicated slot for micro SD, unlike others with hybrid slots along with sim cards. Speaking of sim cards, the Samsung Galaxy ON7 Prime has the standard dual nano-sim slots (GSM+GSM). Considering the cameras; Samsung galaxy On7 Prime comes with 13-megapixel, f1.9 primary camera on the back side and 13-megapixel selfie-shooter on the front end. If the battery is your concern, this 168 gram On7 Prime is powered by a 3300 mAH Li-ion battery. The sensors on the Samsung Galaxy On7 Prime includes a proximity sensor, fingerprint sensor, accelerometer, and Ambient light sensor. Above specs pretty much sum up everything on the phone. So, let’s move towards the review of this Amazon exclusive smartphone. Now, before starting my review and forcing my perspective, let me ensure to you that this review is entirely unbiased and none of there competitor has paid to do so. On that point, let’s get started. When I look at the specs of this phone, almost none of the smartphone trends of 2018 goes checked. At the price point of 13,000-15,000; this “smartphone” is outdated from a 2017 perspective let alone 2018. In short, every specification of the phone is either average or below-average compared to the competitors like Xiaomi Redmi Mi A1, Honor 7x, Moto G5s plus , etc. The processor Samsung Galaxy On7 prime, as I said, is a 1.6GHz Exynos 7870 octa-core processor. This processor was unveiled in February of 2016 by Samsung for their budget-range smartphones which pretty much sums up the modernity of the processor. If kept in perspective with other mid-rangers having a Qualcomm’s Snapdragon 630, the Exynos 7870 is comparatively slow. In 2017, almost every phone had a USB-C charging port which unquestionably is better than the traditional micro USB. However, it is 2018, and I do not understand why Samsung is still stuck with the micro USB although it had a better option. The camera quality of Samsung phones is undoubtedly good, and so does this one especially in low lighting condition. But, when compared to other mid-rangers like Honor 7X, Mi A1, or Moto G5s plus having dual cameras, the Samsung Galaxy On7 Prime with a single lens is pretty weak. Looking at the positive side, In the Samsung Galaxy On7 Prime, the fingerprint sensor is with the home button on the front side and not in some weird position like Galaxy S8. This positive side has a contradicting side too. Due to fingerprint sensor embedded on the screen-side, the phone comes with 16:9 displays instead of 2018-conventional 18:9 one. It’s almost end of the first month of 2018, and this 2018-launched-phone still runs on Nogaut v7.1 despite the fact that updated version Oreo is available. The only highlight of this phone would be the ‘Samsung pay mini’ feature. It is a stripped down version of the original Samsung pay which allows the user to pay using UPI and other digital payment wallets in India such as Paytm. Wrapping up, I would like to say that this Amazon exclusive Samsung phone is not a value-worth-money smartphone in 2018. If you are a Samsung fan and want this phone for its “Samsung pay mini” feature, then surely buy it. But, if you are looking for a good budget smartphone which is not outdated, then I implore you to buy any other alternative. Moreover, if you are not in hurry and have a bit of patience then wait for a few months for other smartphones like Redmi Note 5 to launch and buy one of those. Until then, Goodbye! Subscribe for more unbiased reviews.